Isn’t being alone something most humans are inherently afraid of? I know I often am. About a year ago it struck me that I had never spent more than a day without seeing another human. So I set off alone into the bush, with 9 days worth of food. It was mid-week, and in the middle of winter. I had plenty of maps and a loose plan, but mostly I wanted to experience real solitude and see if it was what I expected it to be. I adjusted my trusty old Macpac gaitors as my dad pulled away from the road-end. Briefly, I wondered what on earth I was thinking. And then I set off along the 4WD track towards the beech forest. I spent that first night huddled in a natural bivvy made from fern fronds and dead wood and when I woke up the next morning, I felt freezing and very alone. I momentarily entertained the idea of turning back and hitch-hiking home. But with a belly full of warm porridge, I pushed the thought aside and continued into the hills. The first few days passed slowly. I purposefully did little walking as I wanted time to simply be. Time to soak in the sounds, smells and textures of the place I was passing through. It is all too easy for me to keep walking from dawn to dusk, it provides a welcome distraction from being alone. To get a real feeling of solitude I felt that I needed time simply hanging out to fully engage with the place I was in. A 3 day snow storm came through and I sat it out, keeping a diary on weather observations, recording all changes in wind direction, temperature, and things I noticed in the sky. Strong winds and snow gave way to glorious blue skies and crispy winter mornings. I enjoyed getting to know the place intimately. I felt a cold wind coming from the south. I watched the sky darken, I waited out a snowstorm. I felt the wind turn NE and the front pass by, and I took comfort in being able to read the weather. As the days ticked over I realised that I didn’t feel particularly lonely anymore. In fact, I felt reasonably content and connected to the world around me. The solitude was refreshing. I had allowed it to sink in and had become comfortable with it. Or at least more comfortable. I pondered what it was that makes a person feel alone. How is it that we can feel more alone in bustling cities, when surrounded by people? As I made my way up a small mountain I felt more alert than usual. The gully was shaded and the snowgrass was covered in a lethal layer of snow. I kept focused, one step at a time, and let out a sigh of relief as I made it to the top. Continuing along a spine of limestone I gazed out over the never-ending wilderness of Kahurangi National Park. Expanses of African desert-like savannah with sheer cliffs of limestone plummeted to the valley floor. I half expected to see a herd of antelope cross the plateau, or a giraffe to pop its head out of the dracophyllum. I blinked and found myself down-climbing a precarious slope; a mish-mash of limestone, spaniards and loose schist. I had a moment of “why the hell did I decide to come here on my own in the middle of winter” and then I carefully dropped my backpack, keen to have more balance. My heart rate was still elevated as I watched it roll into a hole, personal locator beacon inside, and I suddenly felt very vulnerable. Usually I keep my backpack close at hand; it is my survival kit. And I usually wear my PLB around my neck. Then my toes touched hard ground. I took a moment to regather my thoughts and retrieve my pack before continuing through the spaniards, wondering what other surprises would be in store during the trip. The sight of rolling tussock slopes bathed in the glorious glow of the afternoon sun comforted me and I soon found myself stopping early to set up camp for the night. I was mentally exhausted, hungry and wondering why I had chosen to challenge myself in this way. At this point, I was 24 hours into a three day experiment: continuing on for 3 days without eating. I was keen to test my limits and see what influence it had on my body. What would happen to my energy levels, fine motor skills…and how would it influence my general ability to get by safely in the outdoors? I put my tent up, laid out my sleeping bag and boiled a pot of water. I had at least allowed myself the luxury of peppermint tea. I felt at a loose end as preparing a hearty meal is a routine upon arrival at camp. It’s ingrained into me, just like brushing my teeth. I thought about what my usual movements would be – set up camp, get a brew on, cook dinner, enjoy the peacefulness of being outdoors, yarn with friends, sleep. With no friends and no food in my belly, I didn’t know what to do with myself. So I just sat there, taking everything in. Then I went to bed. 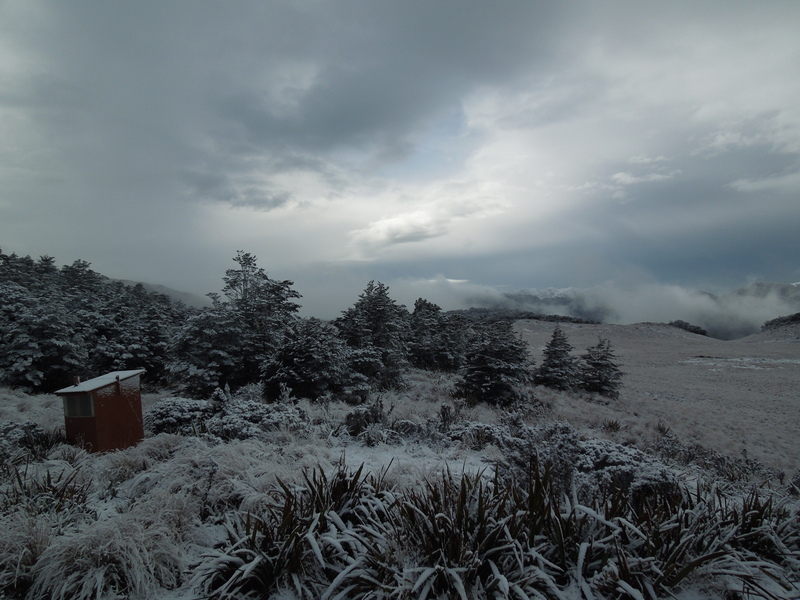 My adventure peaked with a precarious bush-bash down barely passable Kahurangi terrain. At one point I slipped and found myself on my back, centimetres from going over a 2 metre bluff. My heart thumped loudly again, and I continued along, slightly shaky at first. It took a few minutes for my heart-rate to return to normal. I felt vulnerable and alone and was acutely aware of the line I was dancing on. It wasn’t the first time I’d found myself dancing on the line between tramping and climbing. Only this time I was alone, it was the middle of winter, and I hadn’t eaten for two days. I wrestled with bush lawyer, climbed trees to get a better idea of where I was, and I precariously stepped across many icy gullies to make it safely back into the tussocks. With each step closer to civilisation my journey became tamer, less tree roots, I saw my first orange DOC track marker, and slowly the trail turned to a dirt farm track and then gravel. Although I always enjoy the transition from back country to front country, I am usually distracted by lively discussions with friends. Being alone, all of my senses were heightened and I started to reflect on the journey I’d been on. Above all, I realised that companions are key pieces to the jigsaw puzzle of a rewarding trip in the outdoors. The intricate mosaic of experiences, with the glorious and uncertain backdrop that nature provides, is what I enjoy most about the outdoors. It’s sitting atop a piece of limestone, in silence, enjoying an incredible sunset. It’s turning to someone and smiling, sharing a special moment. Words don’t matter, but the presence makes all the difference. It’s the sense of belonging and camaraderie that comes with a group of people in the wilderness. An experience is best when shared. At the end of the trail I flagged down a ute and helped a local man load a trailer up with rocks in exchange for a lift to the main road. From there it was an easy hitch-hike home. I had just spent 9 days without seeing another human.